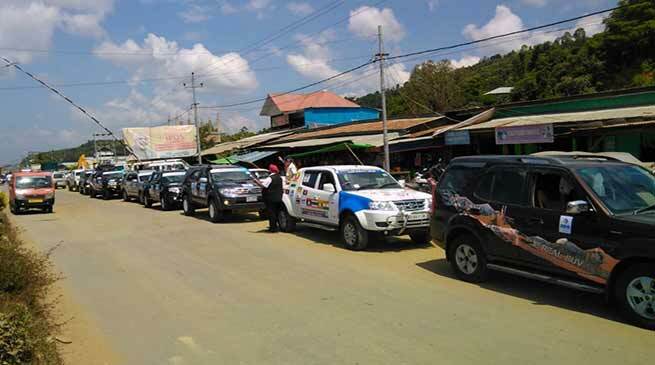 The International Car rally which got flagged off from Tawang on September 12, proceeds it’s journey from Laos for Bangkok, where a business summit will be held on October 1. The team meet the Indian ambassador in Laos before they started their journey. International Friendship Car Rally Association (IFCRA) President Pem Sonam informed the media that the rally which aim on promoting international relationship in tourism, business, traditional and cultural relationship and other is going well. He said that the rally having 67 participants of which 39 are from India. From 39 participating members of country of which 28 are from Arunachal Pradesh and 28 from Thailand. Sonam said that travelling to various parts of the region and continent is also an adventure which itself give promotion of tourism avenue, while meeting with various people on its rout promote the traditional and cultural relationship and strengthened the ties with the country in various matter. He inform that a high level team from Arunachal Pradesh is also leaving to attend the ‘business conclave’ at Bangkok wherein various issue of tourism, regional cooperation, trade and commerce and other matters will be discussed including exchange of tradition and culture will be highlighted. Representation of various tour operator, personalities from business and industry will be taking part. He said that India Asian car rally is first of its kind wherein the participation of the state have been given preference. The event have been sponsored by government of India though Ministry of Sports and Youth Affairs and Ministry of Tourism and government of Arunachal Pradesh though Department of Tourism and department of Youth Affairs and Indian Oil Corporation (IOC) while supported by ministry of Home Affairs and Ministry of External Affairs.